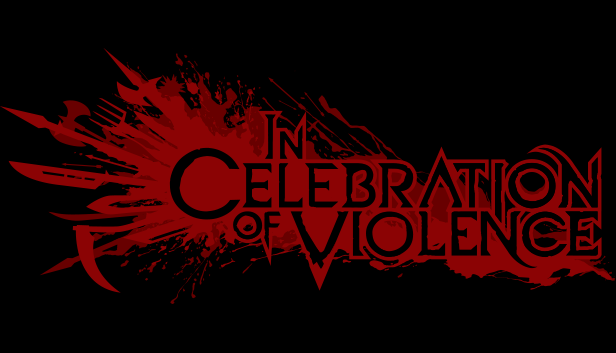 In Celebration of Violence is out on Steam! 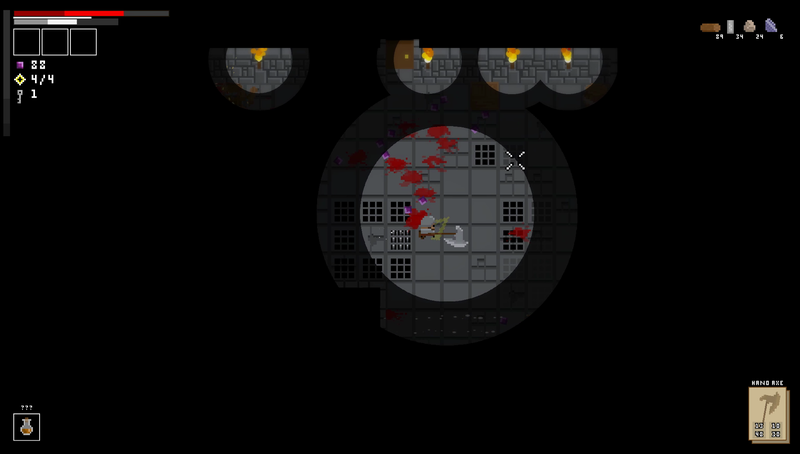 A fantasy action roguelike of exploration and murder. 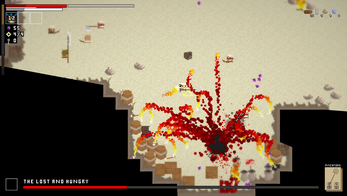 Players move through large open lands exploring, finding/crafting/purchasing items, killing enemies, and gaining experience while preparing to fight the area's boss. The combat is deliberate and methodical, requiring the player to plan their attacks, dodges, blocks, and parries while considering their opponents and the environment. 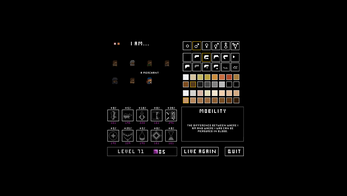 Death is permanent but players can improve their stats and discover items to aid them during future lives. 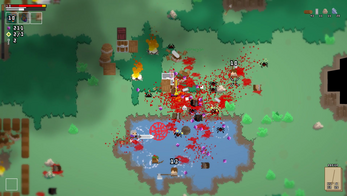 Nineteen (and counting) large, procedurally generated and interconnected lands ranging from plains, to swamps, to cities, to dungeons. These lands offer multiple paths to reach the variety of final bosses. 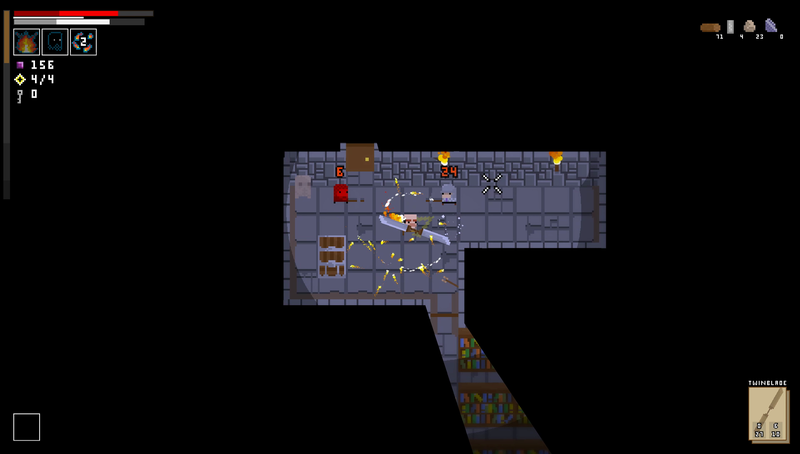 Dungeons are a dangerous but rewarding risk. In dungeons you will have to move slowly and be on the lookout for traps and secrets while searching for the exit. Scores of weapons, items, spells, and mementos are scattered throughout the world to find. One may acquire a powerful enchanted ballista early into one life, only for the next to yield nothing more than a wooden club. That shoots lightning. No life is predetermined for success. Unforeseen obstacles will need to be dealt with in real time and even a regular enemy will be deadly if you're not careful. 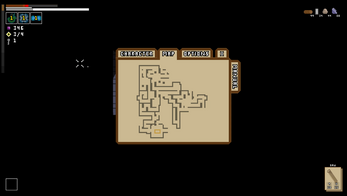 To reach the end, players will need to demonstrate that they are able to consistently overcome these obstacles. Failure can halt or even reverse progress. Elements interact with each other and the environment. Anything flammable will burn, and the fire will spread. This includes grass, wood, arrows, weapons, and of course: people. Lightning and electricity will arc towards entities and is especially dangerous around water. The chances of rain or snow adjust organically to the area's climate and can become both a hindrance and an advantage. Health is a resource that must be carefully managed as there are very few safety nets in place to protect those who aren't careful. Exploration carries its own risks as going without food will dampen your effectiveness. A player can run for the exit and worry little about food, but an explorer needs to efficiently plan their journey. Animal meat can be cooked or eaten raw with the risk of illness. 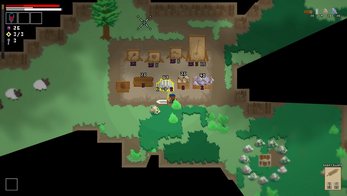 Players will encounter shops that offer items to those who can provide the required materials. 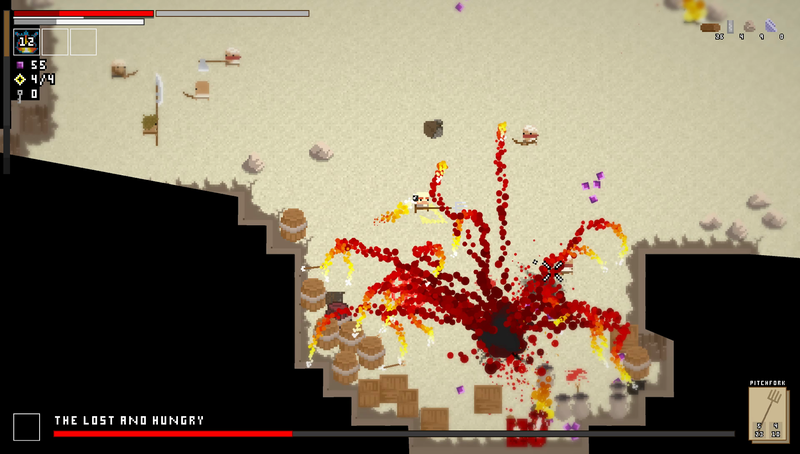 Some materials can be gathered by breaking appropriate objects. 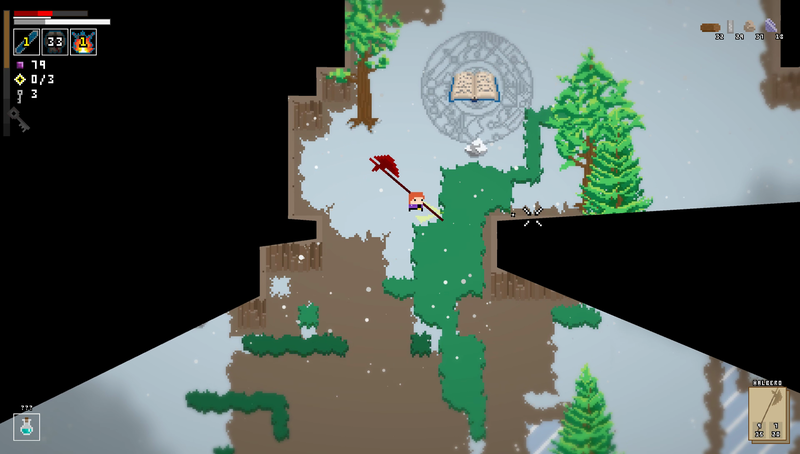 Most objects, such as trees, rocks, and weapons, can be destroyed if a player's attack is suited for the task or powerful enough. 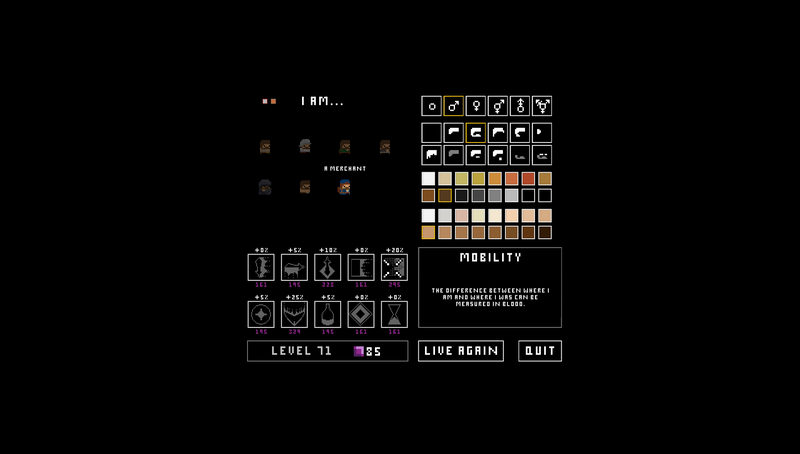 The player can then gather materials to purchase items or trade in a market that adjusts for supply and demand. There are many paths to victory. One could be nimble and stealthy, charge in waving a hammer, raise an army of undead, harness a variety of spells, manipulate enemies into traps or flames, amass resources to acquire the most powerful items, or simply play it safe with a sword and a shield. The various characters offer different starting points, every decision is your own.